The department strives to present to students a full range of musical opportunities. Their studies, in both academics and performance, are guided with a high level of personal attention by musicians of the first rank. Do you have a good teacher for the instrument I play? What about composing? What else do you have? We have excellent teachers on all of the major orchestral instruments, plus piano, guitar, saxophone, celtic harp, conducting, and voice. We have excellent teachers of composition, music history, world music, and theory. For more information about the faculty, or to contact any of them, please see the faculty site. May I play in an ensemble or take private lessons even if I am not majoring in music? Yes! All are welcome. While music majors and many music minors are in an ensemble and take private lessons every semester they are here (both the major and the performance minor require participation in 7 of 8 semesters), non-majors are active participants in our programs. At any given time we have about 50 majors or prospective majors. But in any given semester we will have between 175 and 250 students who are doing something in music, whether taking lessons, singing or playing in a group, or taking a music class. What ensembles do you have at St. Mary’s College of Maryland? For singers, we have a large choir, a women’s choir, and a small chamber choir. For instrumentalists, we have an orchestra, chamber groups (different each semester according to student interest), a jazz band, and a jazz combo. We also have exciting performance opportunities for students in the summer (a program in Italy and a professional orchestra that plays a summer series). See the performance page for more information. There are also student-run groups (gospel choir, a cappella vocal groups). And there are a number of student rock bands. How do I get into an instrumental ensemble? All of the college ensembles have auditions at the beginning of each semester. During the first week of each semester, we post signs with audition times for each ensemble. Our desire is to assess your ability to participate, and we understand that there will be a wide range of abilities. While you are not required to come to the audition with prepared material, an excerpt from a standard sonata or concerto, or an orchestral excerpt will give evidence of performance experience. This applies in particular to returning students who may choose to audition to be considered for a principal chair or advancement in their section. If you are interested in student-run groups, ask around, or check with the SGA (student government association) for music groups that are incorporated as clubs. How do I get into any of the choirs? What about private voice lessons? Early in the first week of the semester, we will post the vocal audition times. The auditions will take at the end of the first week of each semester. The choirs and private voice lessons have a single audition. When you audition, you should express your interest, whether for one of the choirs, voice lessons, or some combination. After these auditions, we will post the private lesson studios and the membership lists for the choirs. How do I get private instrumental lessons? All private lessons are by audition. During the first week of each semester, we post signs with information about how you can make contact with the private lesson teachers to set up the audition. In the audition, we are listening for you to demonstrate preparation consistent with College-level study. We will expect a higher level of preparation from students intending to major in music. You do not have to prepare anything in particular for the audition, though if you choose to do so, that is fine. Basically, we just want to hear how you play. For voice, piano, and guitar, we have class instruction for beginners. For all other instruments, we may take beginners if there is room. How do I find out about the place and time for auditions for getting into ensembles or for private lessons? At the beginning of the fall semester, we will post information on bulletin boards along the music hallway, and in the glass case outside of MH 25 (on the side closest to the practice rooms). For the ensembles, we will post where and when the auditions will be held. For private lessons, we will post the list of private teachers by instrument, giving the time they will be on campus to hear auditions. We’ll post contact information for them as well. As noted above, the auditions for chamber singers, choir, and private vocal lessons occur as a single audition, and the time for these auditions (usually two times during the first week of classes) is posted on bulletin boards along the music hallway and in the glass case outside of MH Room 25.If information is missing or unclear, you can check with the Music Office (MH 23). The person in there will be able to help you. As in most colleges and universities, Music and Dramatic Arts are completely different departments, with different outlooks and philosophies. And yet, every year we put on a Broadway-style cabaret evening, with students performing popular songs accompanied by a jazz combo; and every three or four years, we combine forces to put on a musical. Recent productions have included “Working,” “Hair,” “Three Penny Opera,” and “A Funny Thing Happened On The Way To The Forum.” Our vocal teachers have techniques based in the traditions of classical music, but they also have ability in and knowledge of Broadway and other popular styles. People interested in musical theater are perhaps best served at St. Mary’s College of Maryland by pursuing a double major (Music and Dramatic Arts). They come away with a solid and thorough training in classical music and traditional theater, and so, find themselves with a rich and varied background that widens horizons and increases post-graduate opportunities. 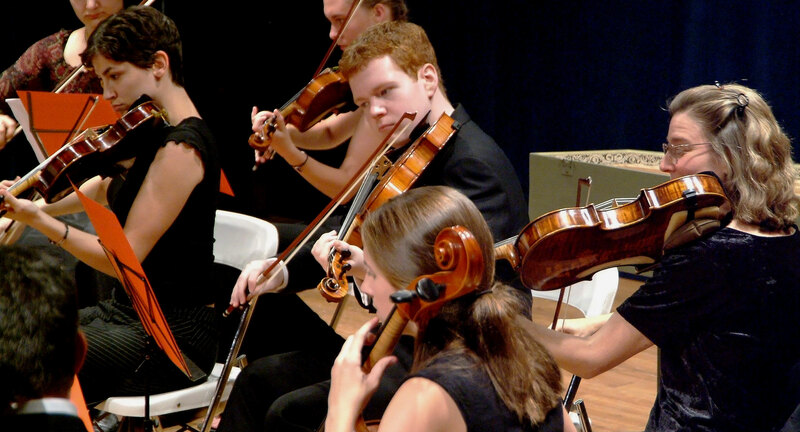 Every summer, the Chesapeake Orchestra, under the artistic direction of Jeffrey Silberschlag, plays a six-concert series on Friday evenings in June and July. The programs include music from the heart of the standard orchestral repertoire, including, in recent seasons, Mahler’s Symphonies No. 1 and 5, Bruch’s Violin Concerto (with Lara St. John), Dvorak’s Symphony No. 9, Strauss’s Thus Spake Zarathustra and Till Eulenspiegel, Beethoven’s Symphony No. 5, Rachmaninoff’s Concerto No. 2 (with Leon Bates) and Rachmaninoff’s Concerto No. 3 (with Jon Nakamatsu). New music has included Kenji Bunch’s Hardware Concerto (with the Ahn Trio) and Jeffrey Mumford’s “verdant and shimmering air,” and much else, including world premieres of music by William Thomas McKinley written for Ben Bradlee as narrator (What the Presidents Said), David Froom (Songs of a Summer Evening, Striking Silver), Scott Wheeler (Gradualia, a piano concerto for Eliza Garth) and Louis Karchin (Chesapeake Overture). The principle players in this full-size, professional orchestra are the music faculty of St. Mary’s College of Maryland. Student musicians play alongside SMCM faculty and other fine musicians, drawn from among the best players of the Baltimore/Washington region, Our students are involved in every part of this series. Those students whose interest includes arts management are paid for the full range of behind the scenes work. Students who are interested in performance are, as appropriate, hired to play in the orchestra. It is possible to do both of these. For details about these and other international or domestic opportunities for SMCM music students, please speak with any of the full-time music faculty. For students with special or particular interests involving work or study in the US or abroad, we have been able to help create custom programs of study. Please come to us with your ideas, and we will try to help.